The purpose of the study was to evaluate the effect on visual function of orally administered CDP-choline in addition to patching for the treatment of amblyopia in children. This was an open label parallel group study comparing patching plus oral CDP-choline with patching alone. Sixty-one participants (aged between 5 and 10 years) suffering from anisometropic or strabismic amblyopia were divided at random into two groups: Group A, 800 or 1,200 mg (according to the body weight) of orally administered CDP-choline and 2-h patching a day; Group B, 2-h patching a day. Both groups were treated for 30 consecutive days. A follow-up visit was set 60 days after the treatment was discontinued. The main outcome measure was the change in visual acuity of amblyopic eyes as measured by Snellen’s E charts. The secondary outcome measures were changes in the visual acuity of amblyopic eye as measured by isolated letters (Snellen’s E) and changes in the contrast sensitivity of amblyopic eyes. The addition of CDP-choline to patching therapy was not found to be more effective than patching alone after 30-day treatment. The present results showed that adding CDP-choline to patching stabilised the effects obtained during the treatment period. In fact, whereas the participants treated only with patching showed a decrease in visual acuity at 90 days, these receiving CDP-choline and patching combined appeared to maintain the results obtained (two-way ANOVA: P = 0.0042). Similar results were obtained when measuring visual acuity by isolated Snellen’s E letters. In amblyopic patients, CDP-choline combined with patching contributes to obtaining more stable effects than patching alone. Fabio De Gregorio works as an advisor for Tubilux Pharma S.p.A. 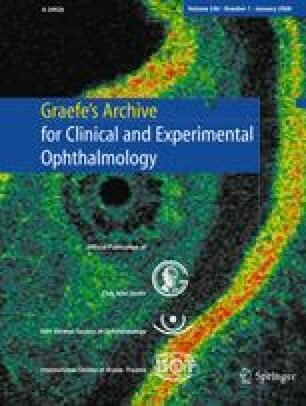 The authors have full control of all primary data and they agree to allow Graefe’s Archives for Clinical and Experimental Ophthalmology to review their data if requested. The study was in part financially supported by Tubilux Pharma S.p.A.